When I first heard about #PokeNOM through The Gluttonous Geek blog I knew I had to come up with something! Then I realized that unless I made/decorated something that looked like a Poke Ball, the options were a little harder. 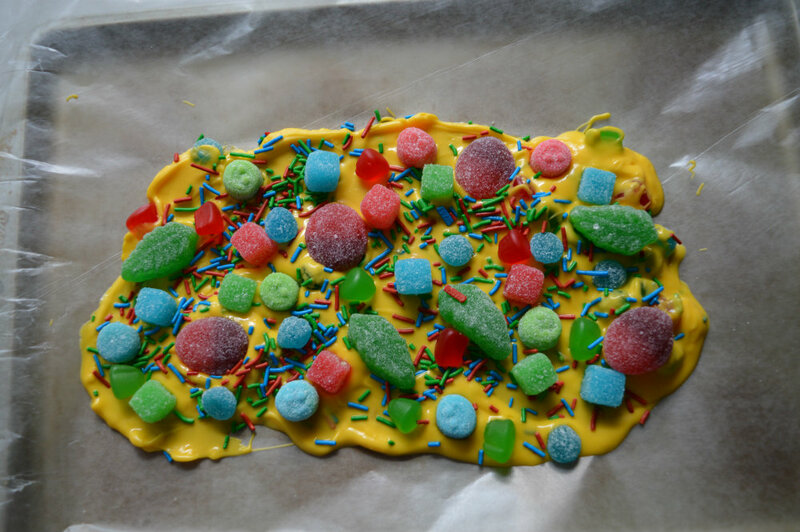 That’s when my brain decided to pop a super easy idea into my head out of the blue – Starters Candy Bark! If you haven’t played Pokemon before, here’s a little explanation: when you start a Pokemon game your trainer gets to pick a Pokemon to start with (with the exception of Pokemon Yellow where you could only pick Pikachu). In every game they change the starting Pokemon characters, but the types are always the same; fire, water, or grass. Or red, blue, or green. 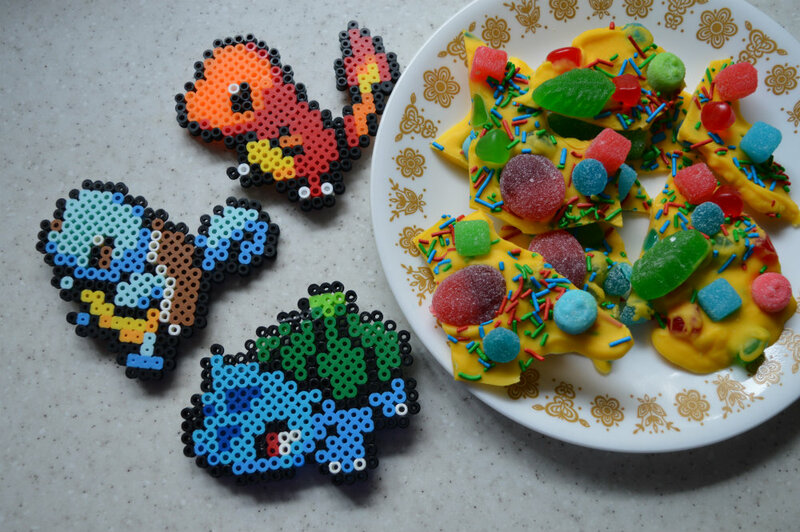 In the first game you had the choice of Charmander (fire), Squirtle (water), or Bulbasaur (grass). With this in mind I went to the Bulk Barn to pick up some suitable candies for my candy bark. 1. Place a piece of wax paper over a baking sheet. 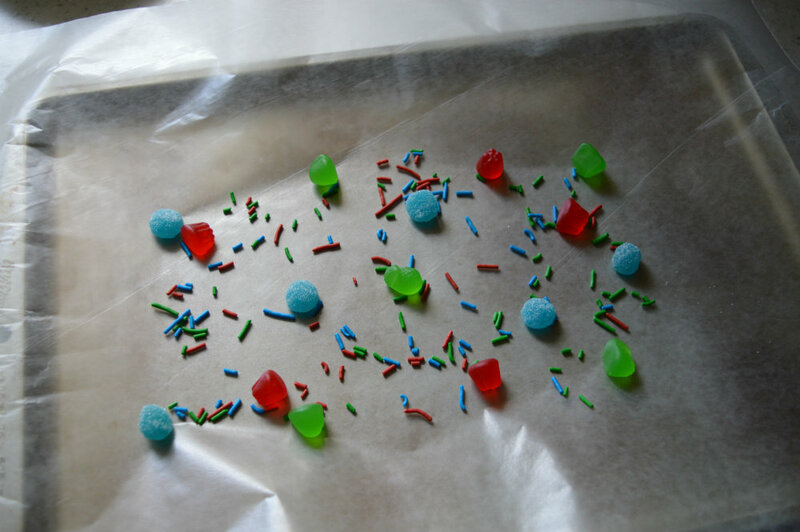 Position some of the candy and sprinkles over the wax paper. 2. 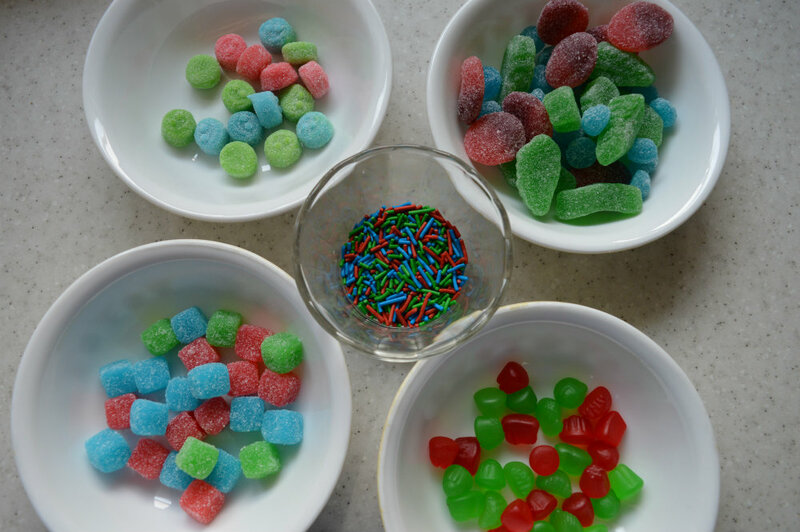 Place your candy melts in a microwave safe bowl and microwave in 20 second intervals; stirring in between each interval. Do not overheat so keep a close eye on them. 3. 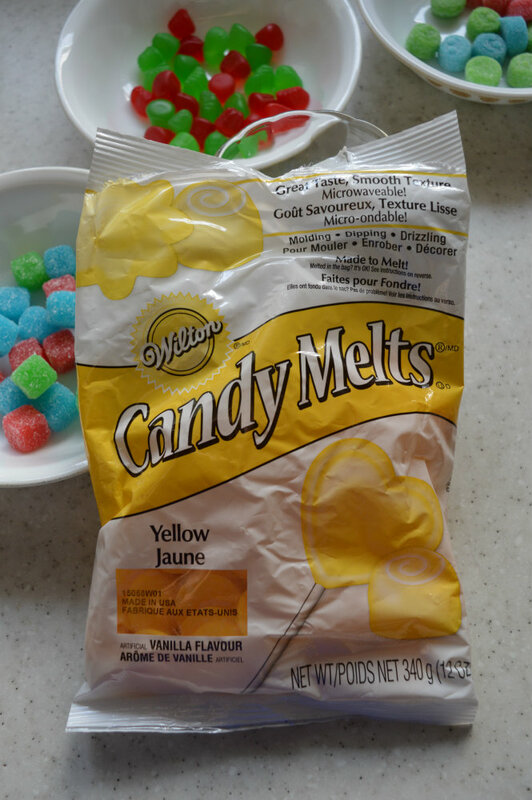 Pour melted candy melts over your candy on the wax paper. Use a spoon to spread it out if necessary. 4. Place more candy and sprinkles into the melted chocolate. 5. Place in refrigerator to cool and harden. 6. Once bark is hard to the touch, break into pieces. Eat and enjoy! 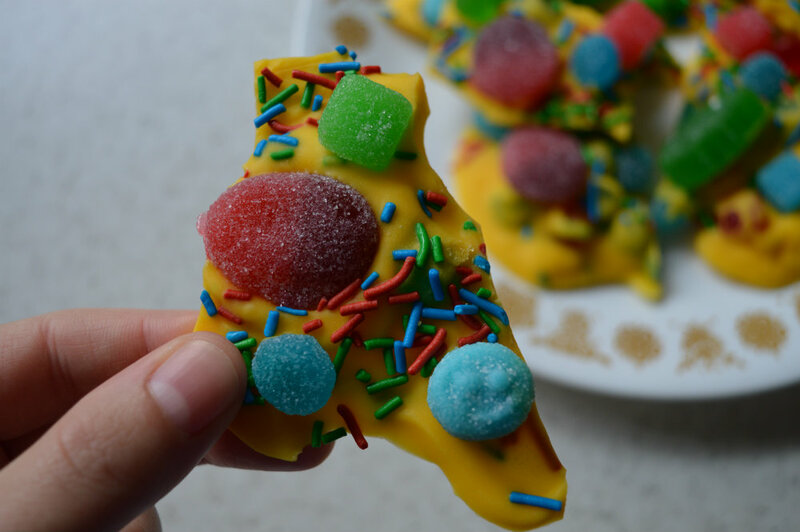 I think candy bark is a super fun treat to make since you can change up the colours, candies, and theme to every sheet you make! And it’s easy enough to make that it’s the perfect thing to bring to a party or put out during movie night. 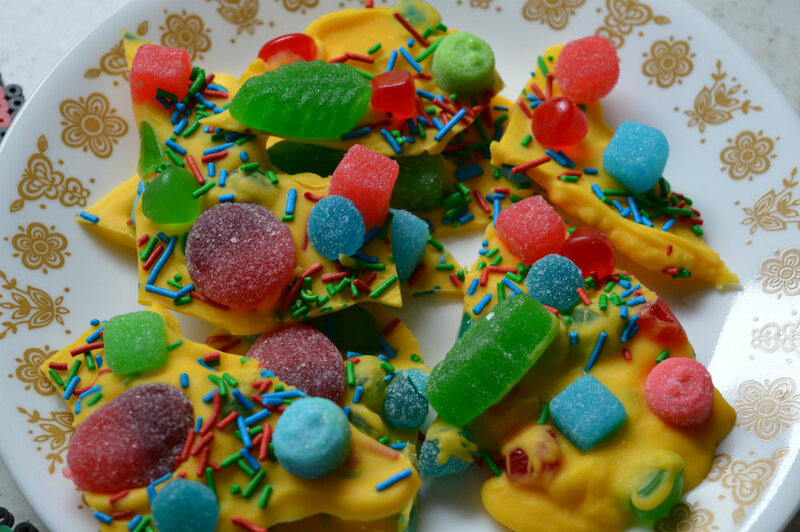 Let me know what your favourite candy bark combination is!